The Leivonmäki National Park is like a miniature Central Finland. Here the nature encompasses forests and mires, lakes, white-water rapids and stunning eskers. It is easy to hike on the light-filled slopes of the esker. The park’s most famous attraction, the Joutsniemi Ridge, pushes into the Lake Rutajärvi. The beautiful ridge formation emerged during the ice age. To the south of the Lake Rutajärvi spreads a beautiful open mire. Cloudberries and cranberries ripen during summer. The European golden plovers build their nests in the mire. The regional emblem of the National Park is the European nightjar. The grey bird is a master of disguise. You can hear the nocturnal bird’s song in the early hours in the summer. The decrease in water levels in Lake Rutajärvi in the 19th century still stands out as a rocky wall. Many species of birds nest in the tranquil shores and islands. The hidden pearl of the National Park is the clear Rutajoki river with its white-water rapids. Birds that are nesting require space. There is ban on all movement in the restricted zone between 15 April and 15 July. However, the Kirveslampi trail and the birdwatch tower are in use all year round! National Parks are conservation areas. Always keep your pet on a lead, take your rubbish away with you and be considerate to other people visiting the park. Head out on two wheels! The mountain biking trail at Selänpohja is an excellent route for cycling. Please stay on the path so the surrounding environment is protected. Most characteristic to the National Park is the diversity of the landscape and the natural features. The park consists of two parts separated by Lake Rutajärvi, which is a barren lake with scarce aquatic vegetation. At some places, the shores grow water horsetails (Equisetum fluviatile) and common reeds (Phragmites australis). There are many different types of landscape on the shores: mires, flood meadows, stone fields, and eskers. Especially on Syysniemi side, the shores are very rocky. In the western part of Syysniemi area, the landscape rises to form an esker which continues from Hietajärvenkangas area through long and narrow Joutsniemi Ridge to the southern part of the park. This esker formation is several kilometres long altogether, and it is geologically impressive and remarkable. This meandering esker chain was formed after the last Ice Age, 10 000 years ago, when the ice was melting. The soil of eskers was accumulated on the mouths of rivers, when the water flowing inside the ice was carrying and sorting sand and gravel, and arranging them in layers. Eskers make diverse habitats for vegetation. The conditions of the habitats vary according to direction and steepness of slopes. The esker forests of Leivonmäki mostly consist of open, dry pine forests. Shady "suppa" holes on the slopes of the esker are marks of large blocks of ice, which got buried in the sand during the Ice Age. They also make the esker landscape more diverse. In the northern part of the park is located the wilderness-like landscape of Syysniemi. Its most valuable features are the over 130-years-old esker forests, and old-growth spruce forests and spruce bogs which are almost in their natural state. Many raptors, woodpeckers and other species typical for old growth forests nest in the area. The Siberian Flying Squirrel (Pteromys volans) and many owls nest in holes in the trees. Along the river, you can find the footprints of the Otter (Lutra lutra ). By its mire vegetation, Haapasuo Mire area belongs to inner Finlands raised bog zone. However, it is located on the transition zone of the northern aapa mires and the southern raised bogs, so aapa mires can also be found in the area. Raised bogs are higher in the middle than on the edges, and therefore the centre only receives nutrients with rainwater. To the edges, more nutrients flow from the surrounding mineral soil. The middle parts of Haapasuo Mire are mostly open bog dominated by Sphagnum moss (Sphagnum) and decorated by the white Sheathed Cottonsedge (Eriophorum vaginatum) in June and July. On the pine bogs on the edges, you can find typical scrub plants of mires, such as the Marsh tea (Ledum palustre), the Bog Bilberry (Vaccinium uliginosum), the Leatherleaf (Chamaedaphne calyculata) and the Dwarf Birch (Betula nana). Haapasuo Mire is an important area for conservation of birds and mire vegetation. For many birds living on open mires, such as the European Golden Plover (Pluvialis apricaria) and the Wood Sandpiper (Tringa glareola), Haapasuo Mire is the most important nesting area in the southern Central Finland. The Willow Grouse (Lagopus lagopus), the Crane (Grus grus), the Northern Lapwing (Vanellus vanellus) and the Yellow Wagtail (Motacilla flava) also nest on Haapasuo Mire. Haapasuo Mire is still mostly in its natural state. Only its edges have been drained in the 1960s. 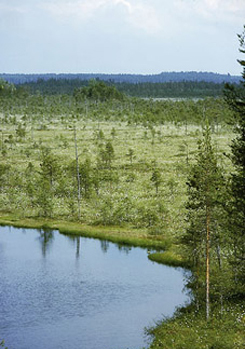 On those areas, restoration works (www.metsa.fi) have been started so that the mire could return to its natural state. Haapasuo Mire in Leivonmäki was one of the first places where ditches were blocked so that the water level would rise. Since then, research has shown that blocking the ditches alone is not effective enough to return the water balance of the mire. Another important factor is reducing evaporation. Trees have been felled to reduce evaporation and to return the appearance of the landscape. Haapasuo Mire is a nationally important mire restoration area. Haapasuonharju Ridge, on the western side of Haapasuo Mire, is dominated by rugged dry pine forests, where the good Lingonberry (Vaccinium vitis-idaea) harvest attracts people to pick berries in the autumn. Like in Syysniemi, in the middle of the more than 100-years-old pine forests you can see small esker lakes, and a diverse tree stand grows in depressions and "suppa" holes, which were made by melting ice after the Ice Age. The sandy Vartijamäki road on Haapasuonharju Ridge is a great scenic road through the southern part of the park. The emblem bird of the National Park, the European Nightjar (Caprimulgus europaus) nests in the old sunny pine forests. Haapasuonharju Ridge is the most important territory area for the Nightjar in Central Finland. The nightjar (Caprimulgus europaeus) favours dry pine heaths as well as rocky and esker pine forests as its habitat. The Leivonmäki National Park offers excellent dwelling sites for this bird. Haapasuonharju Esker is among the most significant territorial areas for nightjars in Central Finland. Unfortunately, the song of the nightjar, which resembles the whir of a spinning wheel, is heard with increasing rarity today. A large number of nightjars that rest on roads are killed by cars, and the nightjar's habitats are used as building sites. During the day the nightjar sleeps on a tree branch or on the ground, trusting its protective colour. The colour is so good that it is almost impossible to detect a nightjar when it lies on the ground. Dawn and dusk are the busiest times for the nightjar. Keeping its huge gape wide open, it flies and catches its food above forests and clearings. Moths and other large crepuscular insects are the nightjar's prey. The nightjar has adapted well to the varying summer weather in Finland. As not many insects fly in rainy and cool weather, a lack of food is a real risk, so the nightjar enters torpor where its body temperature may drop to below 10 degrees Celsius. August–September is the time for nightjars to return to the warmth of the south. They return to Leivonmäki from the African savannas in May–June. Lake Rutajärvi (surface area 1100 hectares) divides the National Park into two parts. Its water level has been lowered twice in the end of the 1800s, 4 metres altogether. Following the water level drop, many small islands were formed in the lake. They are important for landscape and nature conservation reasons. The rocky old shoreline can be seen, for example, along the trail going to Joutsniemi. Because of the descent in the water level, spruce bogs affected by floods have also developed on the shores. On the old accretion areas grow many rare plant species, such as the Early Marsh-Orchid (Dactylorhiza incarnata) and the Spatula Leaf Sundew (Drosera intermedia). The shores on Syysniemi side of the lake have been state-owned land for a long time, and therefore no summer cottages have been built there. That is why they are virtually in their natural state. The nesting birds of Lake Rutajärvi include the Black-throated Diver (Gavia arctica), the Whooper Swan (Cygnus cygnus), the Common Sandpiper (Actitis hypoleucos), Great Crested Grebe (Podiceps cristatus) and Red-necked Grebe (Podiceps grisegena). The Goldeneye (Bucephala clangula) nests on small peaceful lakes. Lake Rutajärvi and Lake Päijänne are connected by Rutajoki River with many rapids. Lake Päijänne is 45 metres lower, so at some places the rapids are steep and waterfall-like. The rapids also make the water rich in oxygen, and therefore Rutajoki River is an important breeding area for the Brown Trout (Salmo trutta lacustris), which needs oxygenous water. Rutajoki River has been cleared and a dam built in the upper course. However, the surroundings have stayed almost in their natural state.